Organic Barley Seeds for Ornamental Grass, for Juicing, Grind for Organic Barley Flour & Bread. 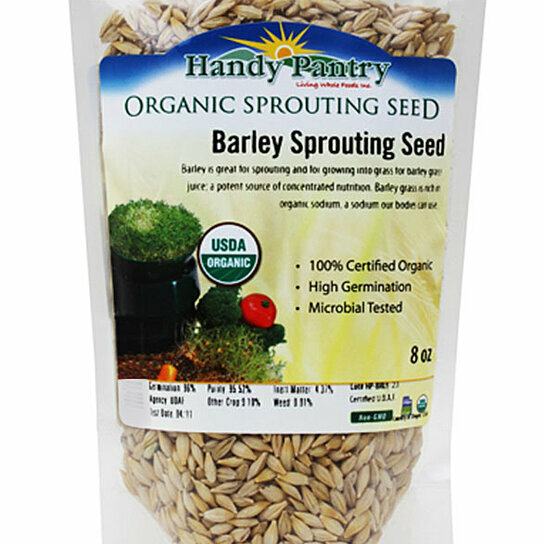 USDA Certified Organic Whole Sprouting Barley Seed. Our Organic Barley Seed has an Excellent Germination Rate 7-10 days for organic barley grass. May help lower cholesterol. General anti-inflammitory uses. Animal Feed. Can help treat stomach and colon disorders. May help reduce risk of cancer. Country of origin: USA. Spectacular germination rate. Certified Organic. Beer Making. Food Storage. Growing Barley Grass.